Our second big tribute show has arrived! Diamond Jack will be taking the stage. Come out to hear the styling of the big stadium bands (think Journey), complete with the lights and smoke. So pull out those leather pants, style that big hair, and come for a party! For our big bands like this, they will hit the stage at 7:30 and play until 10 with two brakes during the event. Yes, we open at 4, so come stake your claim in front of the stage. For this event there will be a $10.00 cover charge for anyone 12 years of age and above. Given the turnout for these events, it’s best to bring chairs, and of course kids and dogs are welcome. Yes, we know it’s good Friday, so what better reason to have a good time? We figured we’d make sure you had a good option of meat of fish, so we are bringing the folks from Fish Tales Dayton out to fry up the good stuff! Note: We always recommend you have extra chairs and such in the car, so throw them in the night before along with your Back Pew glass! Don’t forget you can purchase 6 packs To Go from our Taproom!! On Saturday, April 20th, hop on over to Back Pew Brewing with your little ones for an Easter egg hunt, which will start at 2 pm. Remember to BYOEB (bring your own Easter baskets). All children under 12 are welcome to participate. We'll be closed on Easter Sunday so everyone can spend time with their families. It’s Easter Sunday, so we are letting our folks be with their folks. Enjoy your families, we will see you on Thursday, 4/25! Open 4-9 with Uncle Tony’s Food truck! Churrasco’s will be here for that meal you need after church when you head to The Sanctuary! Food Truck: Fish Tales is doing crawfish and fried food, but last crawfish of the season! There will be a cover charge for this event. Come be Boss of the Toss for Pulmonary Fibrosis!! Bags, beer, live music, food trucks, raffles and a really great time. Remember our first two anniversary parties? No? Well, neither do we. Maybe they were just that epic, or maybe we were too busy brewing great beer to plan them. Either way, we’re making up for it this year with a party that’s sure to be unforgettable. On Saturday, April 6, come on out to Back Pew Brewing to toast the parties we’ve forgotten. We’ll also be celebrating one year of the Sanctuary being open. Enjoy crawfish from Fish Tales Dayton Texas, music courtesy of The Kenny Martin Band from 2-6 pm, and, of course, BEER! Important note: Variants will ONLY be available with our $15 flight, which will get you all 6 Sweet Destruction beers, including the non-aged and all 5 barrel-aged versions. Come out and raise a pint (or three or four) with us. Can’t wait to see you there! Enjoy crawfish and #karaoke while raising money for a great cause. Join us at the brewery for a fundraiser benefitting Family Promise of Lake Houston. Your generous donations will help homeless children and their families. Join the Back Pew Brewing Crew at Brew:30 in Cypress for a Daisy Chain party! As a beer lover, this event is a no-brainer. You better show up, Cypress! Come hang with the Back Pew Crew along with plenty of other hometown brewers, as Moon Tower Inn hosts us all for their 4th Annual Brewhaha! Doors open at noon. Come join us for great tunes, good eats and, of course, your favorite brews! Random Mojo will take the Back Pew Stage from 2:00 - 6:00. We always recommend you have extra chairs and such. Don’t forget to throw them in the car along with your Back Pew glasses! Reminder: You can purchase 6 packs to-go from our Taproom! Grab Your Back Pew Crew! Cover Charge will be in effect. Join us for trivia night at the Mellow Mushroom in Spring. Satyrs Swill, Blue Testament, and one specialty/surprise keg will be on tap! Come hang out for some food, drinks, fun and trivia! Dust off your shamrocks and your best green t-shirt and get ready to toast the Irish this Sunday from 1-5 pm at Back Pew Brewing. We'll be hosting a celebration worthy of Saint Patrick himself, with delicious beer, Mingo's Latin Kitchen Food Truck, and festive green decor. Did we mention we'll be dressed for the occasion? Keep an eye out for any rogue leprechauns. Mingo's Latin Kitchen Food Truck and Catering will be serving up goodness while we gear up for Black Velvet - Rock,Blues,Country and Soul to take the Back Pew Stage at 2pm. We'll be heatin' things up with Uncle Tony's at the brewery! Join the Back Pew Brewing Crew with 11 Below Brewing Company, Southern Star Brewing Company, and Buffalo Bayou Brewing Company for a Daisy Chain party and Steak Night! We'll be offering flights of all 4 Daisy Chain beers. We'll also have games and such for you to win swag or discounted beer prices. As a beer lover, this event is a no-brainer. You better be there, Spring! We're gearing up for a stunning Saturday in the Back Pew. The weather should be gorgeous. You know we'll have plenty of beer but we'll also have hot tubs full of CRAWFISH! @the_kaleidoscope_project will be taking the stage at 2pm! So bring your dancin' shoes. Stop by Hughie’s on 18th Street to taste test our Daisy Chain beer. We made it from a strain of yeast from Southern Star Brewing Company to create a Denali & Lemondrop hop #IPA (4.5%). It tastes like #FruitLoops! Come see for yourself. Join us at Nobi to taste test our Daisy Chain beer. We made it from a strain of yeast from Southern Star Brewing Company to create a Denali & Lemondrop hop #IPA (4.5%). It tastes like #FruitLoops! See for yourself. We’ll be joined by Southern Star, Buffalo Bayou and 11 Below for round one of this Daisy Chain tasting! Come out and try what everyone has brewed up. 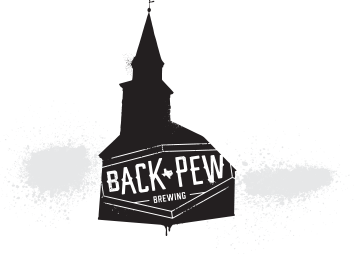 The Back Pew Crew is taking over the taps at The Cedar! We'll be giving out BPB swag and brewery passes. You don't want to miss those! We'll have Blue Testament, Satyr’s Swill and Hopostle on tap. Come have a pint or two with us in Huffman. Join us as we take over the taps at Growler USA! We'll be giving out BPB swag and a limited number of pint glasses. Come hang with us in Katy. The Back Pew Crew is taking over the taps at The Draft! We'll be giving out BPB swag and brewery passes. You don't want to miss those! Come hang with us in Kingwood. We're spicing things up with the Pho-jita food truck. The Crashers will take the Back Pew Stage at 2pm. Better grab your dancing shoes. We’re also celebrating Women’s History Month with #GirlsDrinkBeerToo. Ladies, show us what’s up! 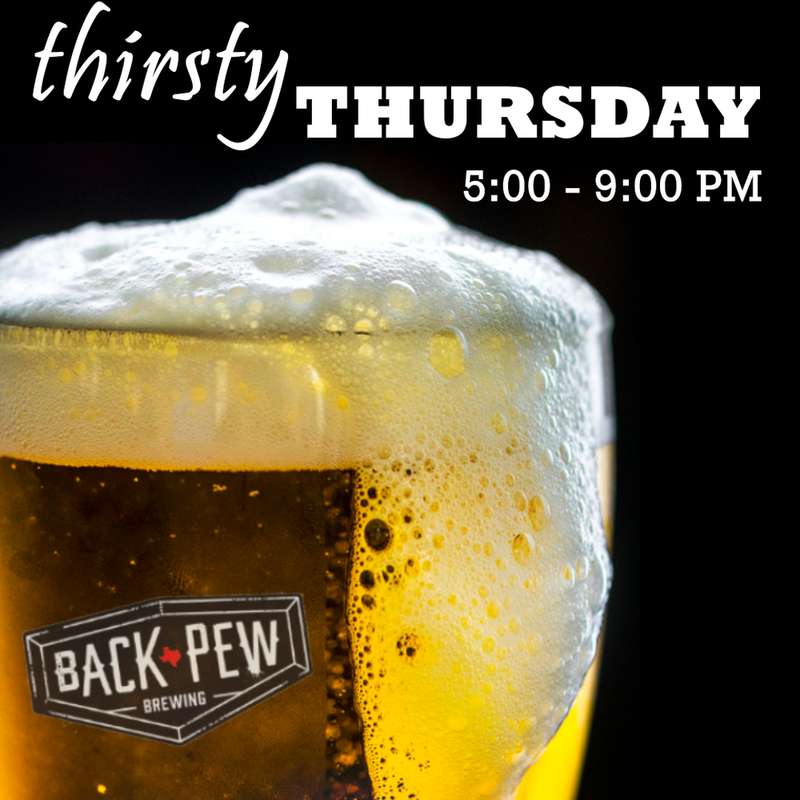 Come on out to Back Pew Brewing for Thirsty Thursday and make Friday a better day!